It's the Blue Ninja leader versus Cobra Commander in the final confrontation between their respective forces. Fortunately for the Commander, the Blue Ninja have picked up a few enemies with personal vendettas along the way. Larry Hama and S.L. Gallant bring us the conclusion to the epic Blue Ninja saga. Hama's been building up this storyline for the better part of the year, so it's disappointing that the conclusion falls so flat. The army of Blue Ninja that had taken siege of Broca Beach seemed to have disappeared this issue. 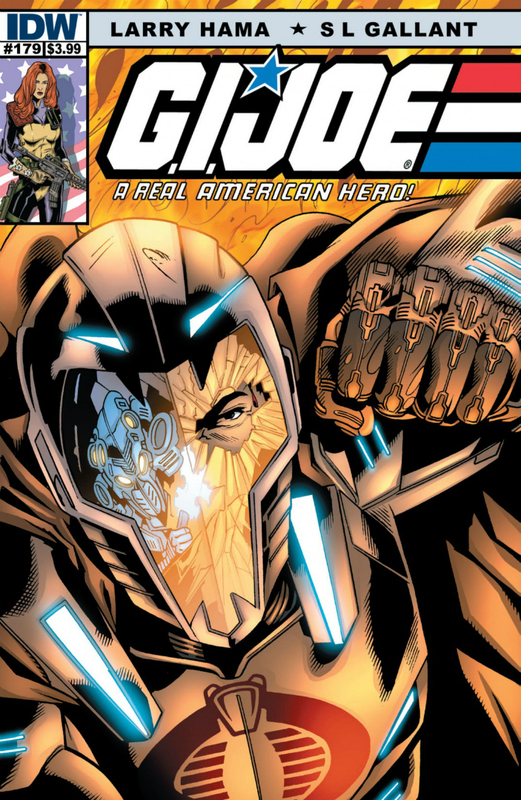 In truth, they were battling Joe and Cobra forces, but what seemed like such an oppressive and undefeatable threat in the last couple months now seemed so easily dismissed they barely warranted a few panels this issue. Hama has been clearly leading up to a confrontation with the Blue Ninja leader by those were hurt by Billy's death, but the scenes in which they all work together to take him down seemed very contrived and forced. While there's a couple good lines of dialogue, the writing felt uninspired. This may be Hama's worst issue in the past year. In fairness, I have a tendency to be disappointed by the endings of long storylines, no matter how well they started. And this one did start great. The strength of the story was not in the fights or the introduction of yet another chapter of the Arashikage sage. It was the emotional punch of the unexpected death of a character we literally saw grow up. It was watching Cobra Commander show powerful, genuine emotion on a scale we've never witnessed before. It was the sickening realization that the "innocent" families of Cobra troopers were mercilessly slaughtered. But those emotional undertones were drowned out this issue by a long, drawn out melee battle, with characters occasionally shouting out "For Billy!" Hama had initially hooked me with some deep and powerful moments in setting up this storyline. The conclusion of the fight, and this saga, felt pretty empty in contrast. I enjoyed the characterization of Cobra Commander in this story arc up until this issue. His reaction to the death of his son and his actions afterwards showed sides of the Commander we had never seen before. I felt Hama had taken it too far with this issue, however, having the Commander throw his body in the line of fire to protect others (two ninja, no less, and two people he would otherwise love to see dead). While I enjoy seeing Cobra Commander on the front lines, I expected to see more of the tactician, and less of the fighter. Where was the heavy artillery? Why did it seem that no one had anything more powerful than armor-piercing bullets and a single grenade-launcher? Where were the preparations Cobra made for a possible Joe invasion of Broca Beach? In the lead up to this issue, I assumed that the Commander had a trick or two up his sleeve. His actions this issue, while fitting the storyline, did not fit his character. Any weakness I found with the plotting in this issue was balanced by Gallant's art. He made the conclusion feel even more epic by making every second page a splash page. It gave the book almost a cinemagraphic quality, and made me forgive some of the weaker parts of the writing. Gallant and Hama make an excellent team…and in this month, I felt that Gallant completely carried that team. "So, step aside and let me unleash the full power of my reactive battle armor against this perfidious proctalgiac prosthetic perambulator!" A weak ending to an otherwise interesting (if drawn out) story arc. A Passable issue that concludes a Recommended storyline.